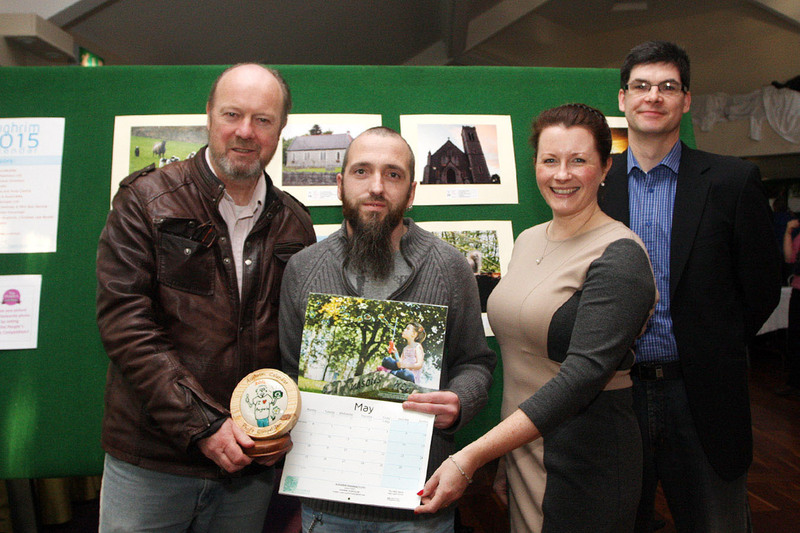 Pat Nolan (one of the judges) Deirdre Fox Secretary ABA, Neil Gallagher Chairman ABA congratulate the overall winner of Aughrim Business Association 2015 Calendar Competition Christopher Howes from Arklow with his award winning picture ' The Wishing Well' which features in the Month of May. The 2015 ABA Calendar is on sale locally costing €8 each or two for €15. The prize-giving ceremony for the fourth Aughrim Business Association photography competition, together with the launch of the 2015 Aughrim Calendar took place on Sunday 2nd November in Lawless’s Hotel. Deirdre Fox, Secretary of the Business Association extended thanks to the management and staff of Lawless’s Hotel for the use of the wonderful venue and to Aughrim Tidy Towns for the use of their facilities at the Pavilion during the judging phase of the competition. First Place: Christopher Howes, Arklow, 2nd Place, Colin O’Driscoll, Annacurragh, 3rd Place, Sheila Doran, Avoca. The remaining nine selected for inclusion in the calendar were: Nikki Flynn, Aughrim, Angela Connor, Lucan, Dylan Doran, Avoca, Fidelma Read, Cork, , Máirín Mhic Sheoin, Aughrim, Martin Darcy, Ballintemple, Patrick Byrne, Aughrim, Sheila Doran, Avoca and Sadie Agar, Aughrim. That the adjudication of the competition be fair and impartial was imperative and the Business Association was delighted to have as their judges Pat Nolan from Conary and local photographer, Ann Egan . Speaking at the ceremony, Deirdre commented that although the main focus of the afternoon’s event was the unveiling of the finalists and the announcement of the overall winner, it was also a celebration of every single entry. The organising committee comprising Christien van Bussel, Ursula O’Halloran and Deirdre Fox was genuinely overwhelmed by the quality of the images submitted. All photographs entered will be exhibited in Lawless’s Hotel where the exhibition will run until next Saturday 8th November. All are very welcome to come and view it at leisure. This year, a People’s Choice competition is being held, where visitors to the exhibition can vote for their favourite photograph. The three photos with the most votes will be framed and presented to the winners at the Christmas Fair on 7thDecember. Deirdre Fox also thanked the sponsors of the competition. The following local businesses came on board and generously donated the funds for the prizes. Anne’s Launderette, Aughrim Language School, Aughrim Pharmacy, Byrne’s Londis, Byrne’s Funeral Directors, Byrne’s Tyre & Auto Centre, Deirdre Fox & Associates Solicitors, , Sean Byrne Hackney & Mini Bus Hire, SK Dublin Au Pairs, Studio Upper Aughrim, The Beauty Spot, Tom Tiling, O’Neill & Flanagan Ltd Auctioneers, Woodfab Timber Ltd, and Aughrim Business Association. Thanks were also given to Christien van Bussel who designed the trophies for the twelve winners. Deirdre thanked all the members of the Business Association for their investment of time, effort and money in Aughrim which she stated was testament to their commitment to the town. She said that Aughrim is a wonderful place to work and do business. She noted that, in the current economic climate, the only way we will all pull through is if the business community and the residents support each other – it’s a two-way street. Aughrim needs your Business!! The calendar is available to purchase at a cost of €8 from local retailers.